Dell has expanded its range of hybrid devices with the XPS 11, which can transform from tablet to laptop with the flip of a screen. The XPS 11 has a hinge that allows the panel holding its 11.6-inch screen to be folded almost 360 degrees so that the device can be used as a tablet. 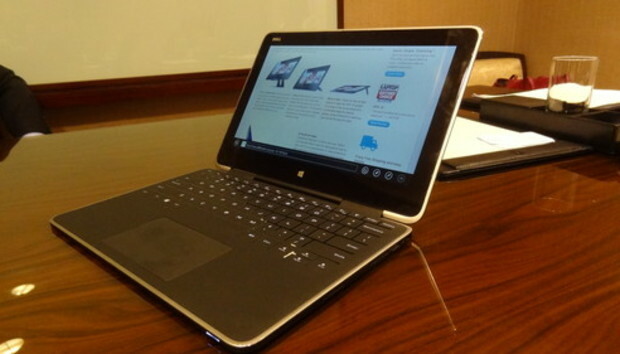 The design is similar to that of Lenovo's IdeaPad Yoga hybrids, which are available with 11- and 13-inch screens. Dell announced the hybrid on the sidelines of the Computex trade show being held in Taipei. It will ship later this year with Windows 8.1, code-named Blue. Pricing was not disclosed. The XPS 11 keyboard is tightly integrated into the chassis, so the keyboard buttons don't stick out when the device is being used in a tablet mode. The 2560 x 1440 pixel display has a Gorilla Glass layer for durability. The device will ship with an Intel Core i5 processor code-named Haswell. Dell is beefing up its laptop, tablet and hybrid offerings as it tries to keep its XPS line of computers relevant in a poor market for Windows 8 and PCs. The XPS 11 augments a product line that includes the XPS 10 tablet and XPS 12 and XPS 13 hybrids. The size of the screen matters less than the functionality, portability and battery life, said Kirk Schell, vice president of computing products at Dell, in an interview. "The thickness, weight and resolution are critical and all of that has to fit in the right package," Schell said. Schell sees a diverse computing market ahead. Some consumers prefer tablets, while others will want hybrids with keyboards attached. "Detachables, convertibles, two-in-ones will be part of the market," Schell said. "For us, one-size-fits-all is not an answer." Dell is the third largest PC vendor in the world behind Hewlett-Packard and Lenovo, but its shipments have been falling. Dell started off as a PC maker in the 1980s, but refocused in 2007 to concentrate on the high-margin enterprise market. But the PC division has gained importance again, with the hybrid device market being an area of opportunity for the company. Whether or not the current proposal to take the company private succeeds, Schell said Dell will continue to expand its client product offerings. Dell once said it would focus on high-margin PC offerings, but Schell said the company will compete at multiple price points as it tries to increase product shipments. The company will try to differentiate by offering more security and support features, and it will also expand in the client computing market through its Wyse thin client division. Dell will also continue to invest in Windows 8, and evaluate Windows RT and different processor architectures for tablets and laptops, Schell said. Dell today offers XPS 10 with Windows RT and has said it was developing a successor to that tablet.